Like a big oatmeal raisin cookie, crossed with pecan pie! 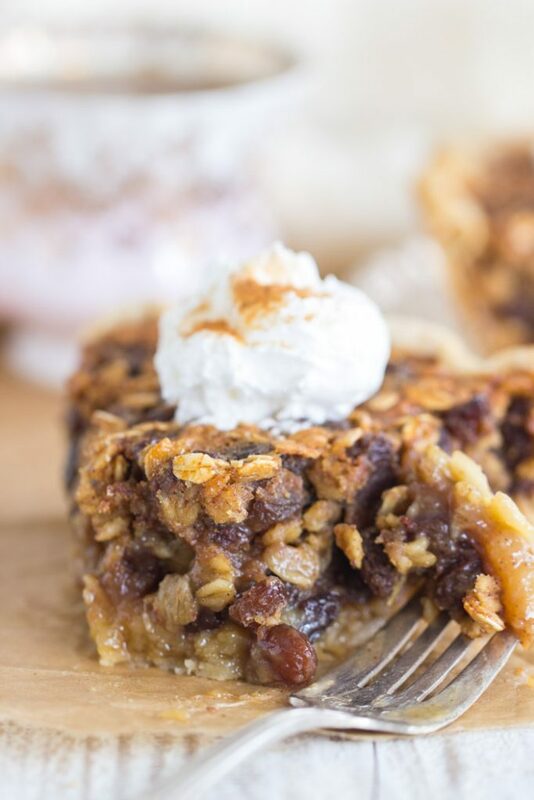 This Oatmeal Rum Raisin Pie is ooey, gooey, sticky, and sweet like pecan pie filling, but it’s loaded with soft, rum-soaked raisins, and oats that are toasted to a crisp! 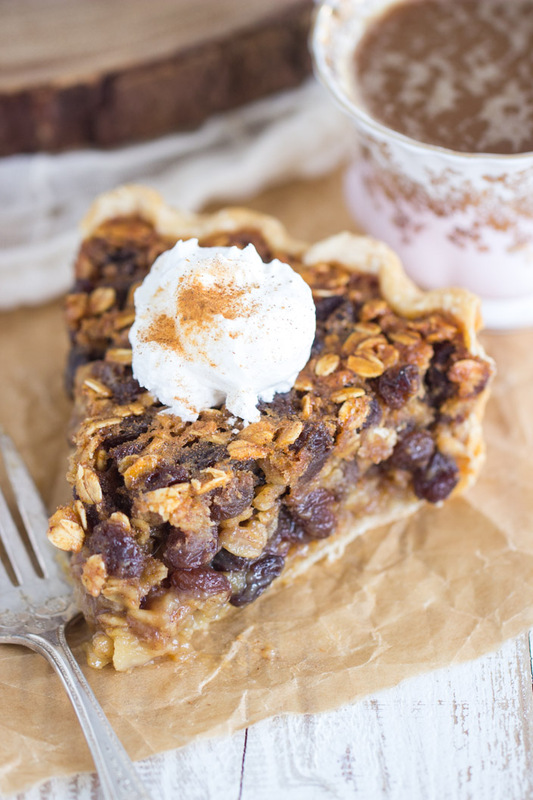 This Oatmeal Rum Raisin Pie is mind-blowing! Try it once, you’ll see what you’ve been missing! November is the time for pies, yes? So pies you shall get. 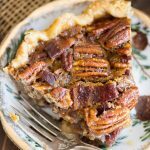 There’s a slew of pecan pie recipes coming, the least of which includes the Bourbon Bacon Pecan Pie that I posted yesterday. 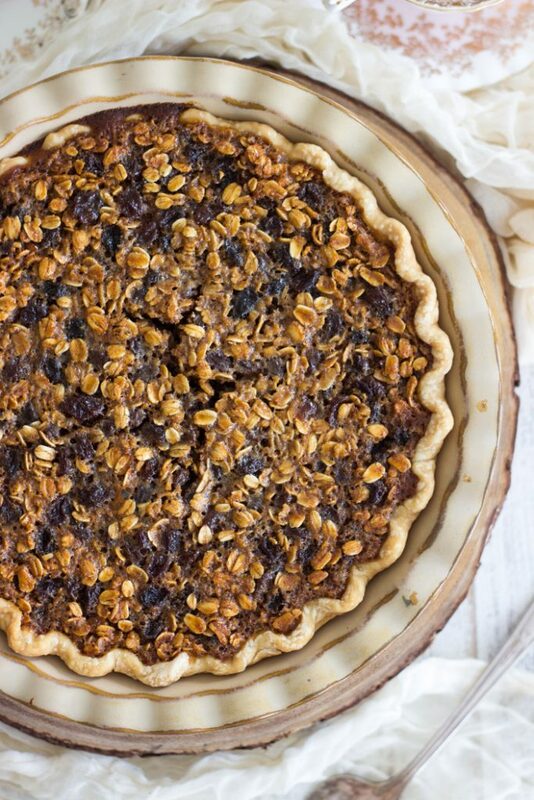 But before we start on the pecan pie extravaganza, let me get this Oatmeal Rum Raisin Pie to you. I’ve been sitting on this one for awhile, and I’ve been waiting for November, the unofficial pie month. So, this might sound weird: a pie with oats in it. I get it, it sounds strange. 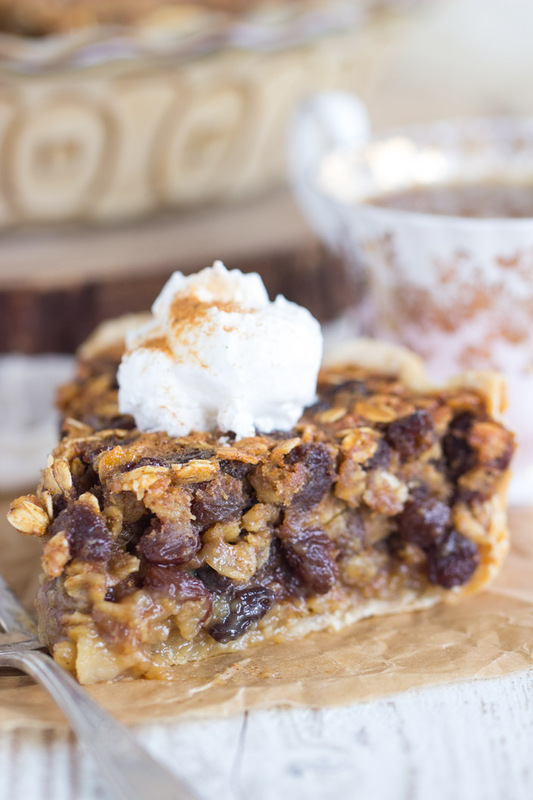 But this Oatmeal Rum Raisin Pie is like a pecan pie crossed with an oatmeal cookie. And even better than that, it’s boozy. Basically, you make a pecan pie filling, but instead of adding pecans, you’ll add oatmeal and raisins. 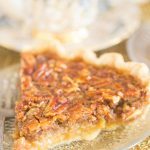 It’s amazing because you get all the wonderfulness of a pecan pie – ooey, gooey, sticky-sweet, brown sugar-goodness. And you get all the goodness of an oatmeal cookie – plump raisins, and crispy, toasted oats. PLUS… rum. That’s just a bonus. Some of the oats end up soft and chewy as they bake into the filling, and the oats that sit on top are more crispy and toasted. It’s quite awesome. I’ll confess something: I don’t even really like raisins that much, but I freakin’ LOVE this pie. I like raisins situationally, I suppose. I like them dunked in milk chocolate, or in oatmeal raisin cookies. Well, and in this Oatmeal Rum Raisin Pie. They’re amazing in this pie, and I’d never not include them. Though the thought does occur that dried cranberries could be pretty great… maybe next year. Point is, even if you’re not a raisin person, or say you’re not an oatmeal person, you will still die for this pie. It’s mind-blowing. Pleeeease tell me you’ll try this. 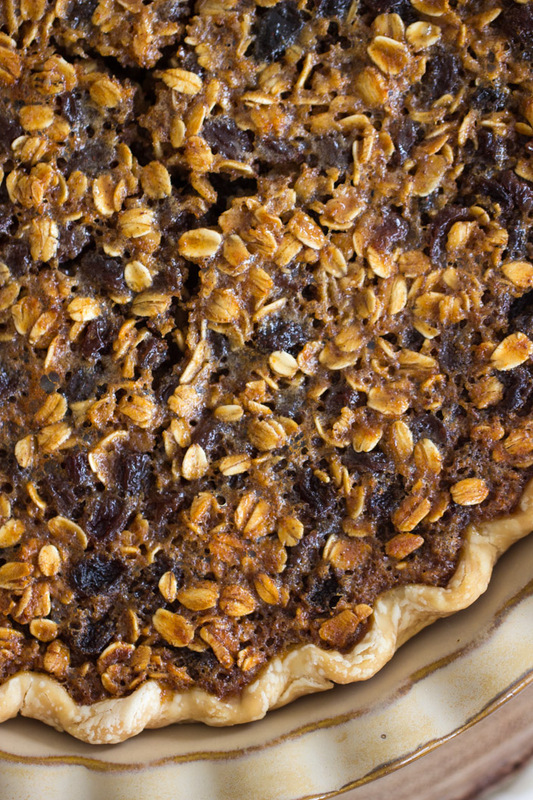 You need to try oatmeal in a pie, and then report back. You’re going to love it too, I just know it. 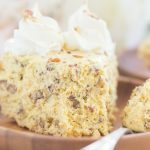 Like a big oatmeal raisin cookie, crossed with pecan pie! 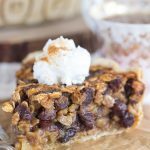 This Oatmeal Rum Raisin Pie is ooey, gooey, sticky, and sweet like pecan pie filling, but it's loaded with soft, rum-soaked raisins, and oats that are toasted to a crisp! 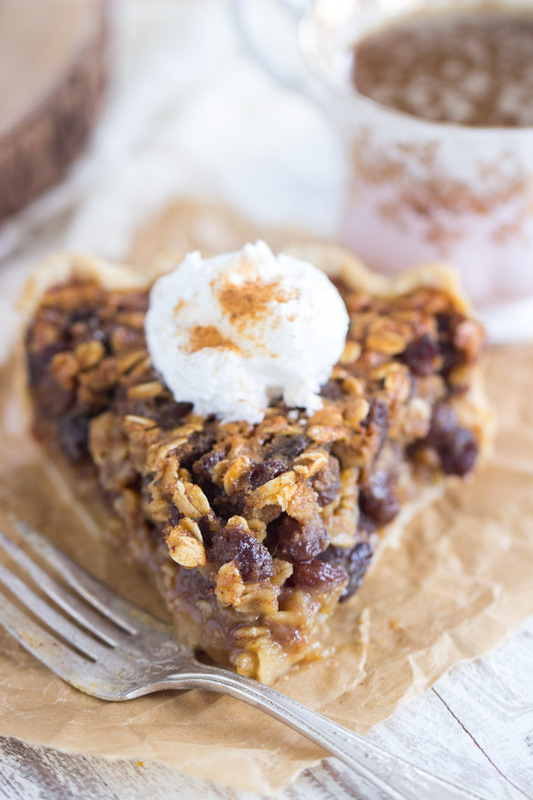 This Oatmeal Rum Raisin Pie is mind-blowing! In a small saucepan, bring raisins, rum, and water to a boil over medium-high heat. Reduce heat to low, and simmer for 2 minutes. Remove from heat, and let sit for 30 minutes. Drain remaining liquid. 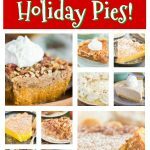 Arrange pie crust in a 9-inch pie plate, and crimp or scallop the edges. 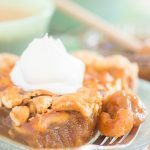 In a large bowl, whisk together brown sugar, flour, cinnamon, nutmeg, and salt. Add eggs, corn syrup, melted butter, vanilla, oats, and raisins. Bake at 350 degrees for about 45 minutes, or until edges are golden, and the center appears set. Set on a wire rack to cool completely. Cut and serve. I know this is an older post but OMG! I love this pie? The flavor is perfect , the textures are delicious! I think I found a permanent pie on my holiday list. Thank you so much for this gem of a pie! Oh, yay!! I’m so glad you like it. I LOVE that pie, and sadly, it doesn’t get a lot of views. I wish it did because I think it’s a gem too. Thank you so much for your sweet comment!